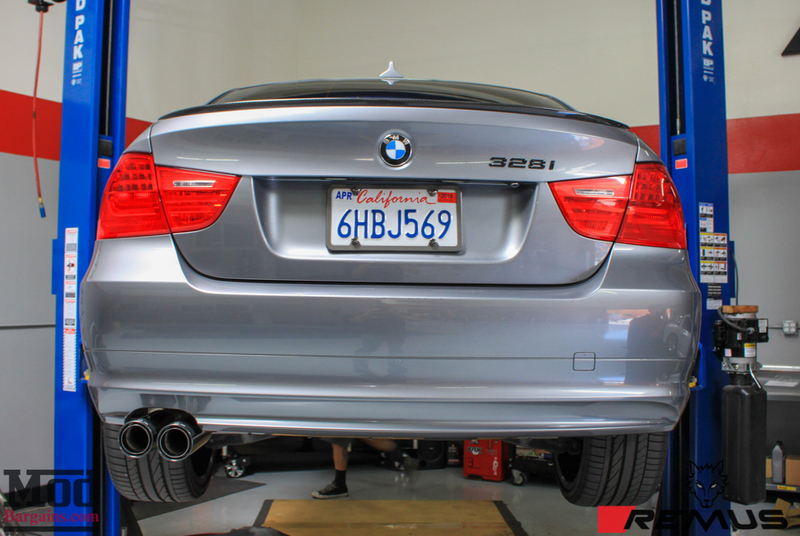 At ModBargains, Remus Exhaust Systems are one of the most popular brands for BMW E90 Exhausts on the market – though most of the time when we see an exhaust for a 328i, it’s usually a quad setup – that’s why when this E90 BMW 328i LCI came in to be fitted with a Remus Axle-Back Exhaust for E90 328i with the single-exit dual tip configuration, we had to get some photos to share with you guys. 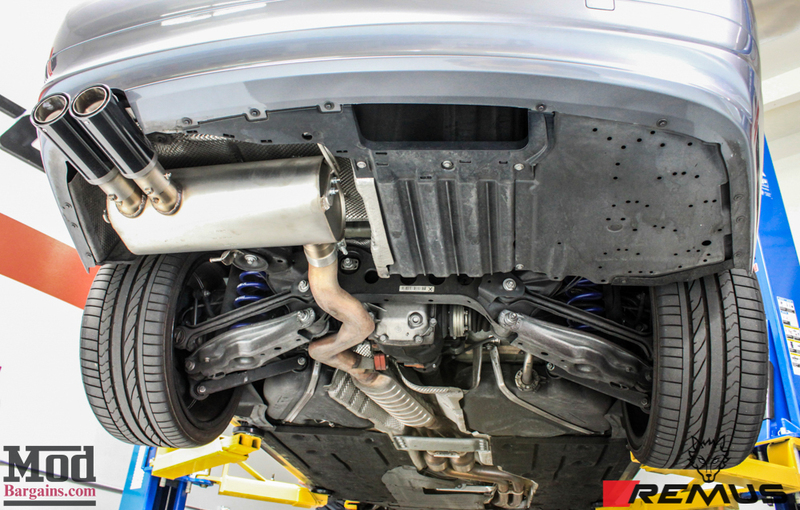 The 84mm Carbon Fiber Trimmed Street Race style tips look great and fill the factory exhaust opening quite nicely. 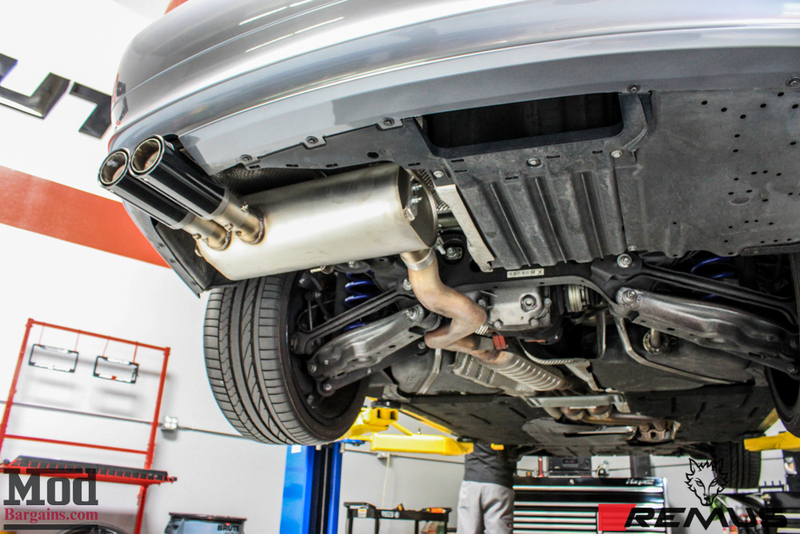 The carbon fiber trim of Remus Exhaust‘s trademark street race tips is a great accent to any performance build, and since Remus is an OEM exhaust component manufacturer for BMW, these systems offer a refined yet authoritative sound that’s perfectly appropriate for a german car. Since they’re made by the OEM exhaust manufacturer, Remus Exhausts fit great whether you opt for Axle-Back or Cat-Back exhaust options and will look and sound great for years to come. If you’re looking for an exhaust system that will enhance the look, sound and performance of your BMW, you owe it to yourself to let the Wolf Inside howl with an exhaust system from Remus Innovation. Interested in changing up the look and performance of your BMW E90 328i, 335d or 335i? Ask the Mod Experts what E90 exhausts are available now to change the style and sound of your 3er. Call us at 714-582-3330 for expert car mod advice and schedule your installation at the Mod Auto shop today. Want to learn more about modding your BMW E90? 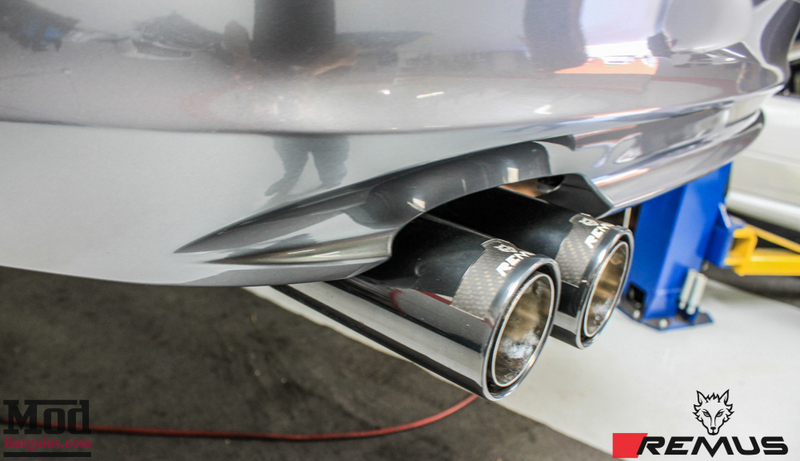 Check out our guide to the Best Mods for BMW E90 335i, 328i and 335d here. ModBargains Book Groups Cost us $10,000 per Book – Why do I do it?